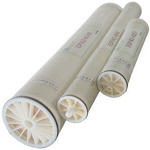 FILMTEC NF90-4040 Membrane Elements The FILMTEC NF90-4040 nanofiltration element is a high area, high productivity element designed to remove a high percentage of salts, nitrates, iron, and organic compounds such as pesticides, herbicides, and THM precursors. The high active membrane area combined with the low net driving pressure of the membrane allows the removal of these compounds at low operating pressures. FILMTEC NF90-4040 Membrane Elements The FILMTEC NF90-4040 nanofiltration element is a high area, high productivity element designed to remove a high percentage of salts, nitrates, iron, and organic compounds such as pesticides, herbicides, and THM precursors. The high active membrane area combined with the low net driving pressure of the membrane allows the removal of these compounds at low operating pressures.